The last couple of years I have been making use of Cynefin to make sense of complexity in project organizations. Cynefin has helped me to make sense of how projects differ and how to cope with these differences. More recently I discovered the Panarchy model. Just like the Cynefin model the Panarchy model helps to make sense of complex systems. Specifically, it helps to make sense of the dynamics of evolving hierarchical systems with multiple interrelated elements. The panarchy model originated as a framework for understanding resilience in social-ecological systems. I think it may also have a great potential as a sens-making framework in the context of project organizations (that clearly fit the description of “evolving hierarchical systems with multiple interrelated elements”). 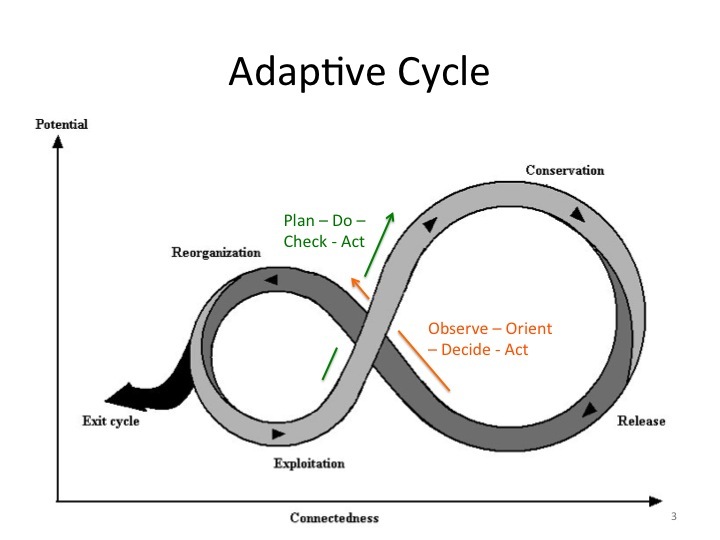 The metaphor of the adaptive cycle helps to make sense of the evolution of practice in organizations as depicted in the figure below. Similarly it can help to make sense of the evolution of the (hierarchical) systems (with many interrelated elements) that we are building. 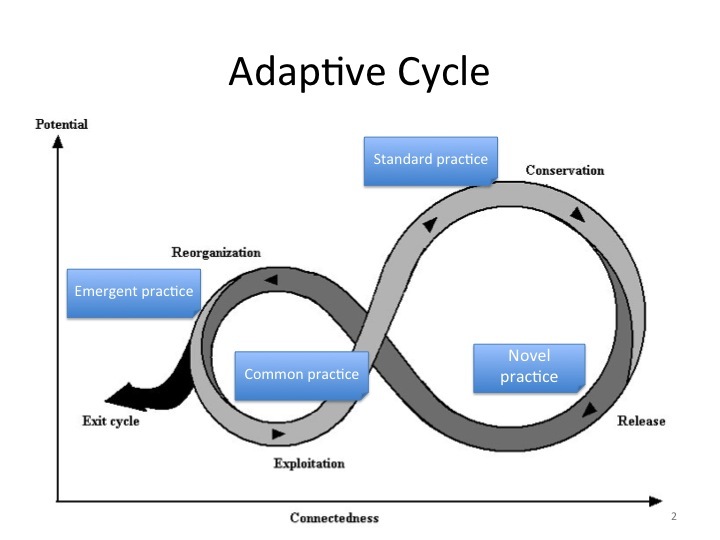 Equally important, the adaptive cycle can help to make sense of the mechanisms that we use to improve practice. I have seen people use and misuse the concepts of PDCA (Plan-Do-Check-Act) and OODA (Observe-Orient-Decide-Act). 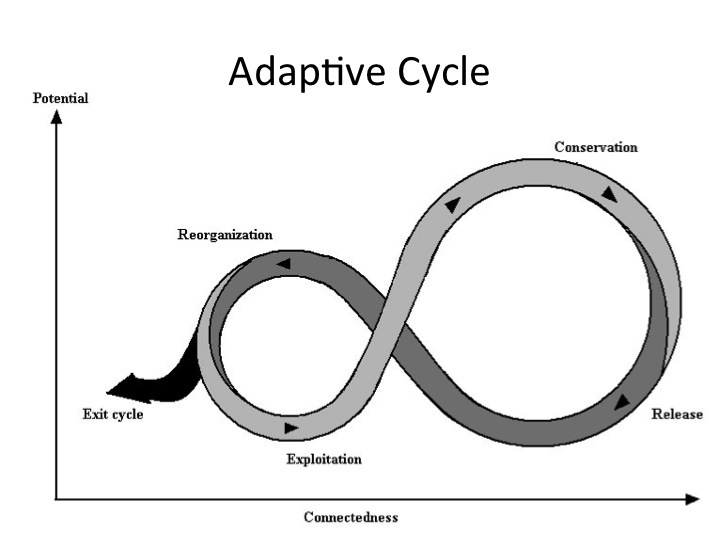 Using the adaptive cycle metaphor we can clearly situate both cycles. Also within project organizations we observe nested cycles. We can see organization-wide practice development at a longer time-scale (multiple years) and we can see practice development at the team level at shorter time-scales (weeks and months). We can see product evolution at the time-scale of the product life-cycle and we can see product evolution at the time-scale and scope of individual features. The metaphor of nested adaptive cycles can help to make sense of the interactions between these different levels. Shorter adaptive loops (of teams and features) can reinforce the longer adaptive cycle (of the whole organization and the product). 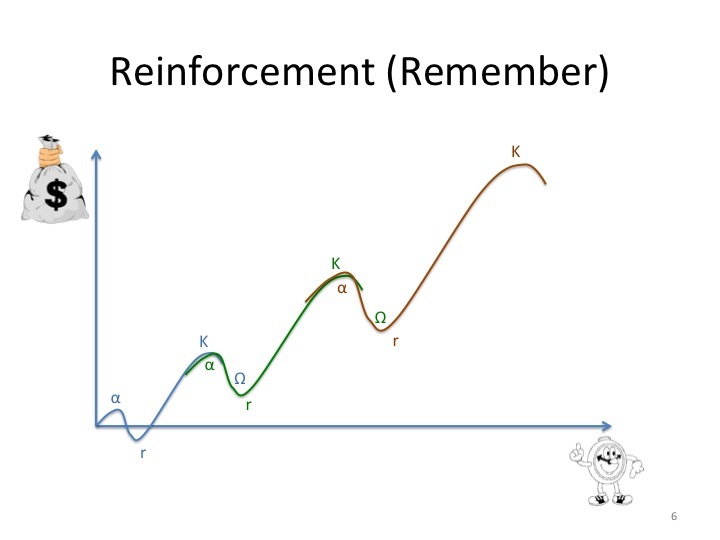 The effect of these reinforcing loops on the value curve is reminiscent of the so familiar J-curves and S-curves. Similarly, shorter adaptive loops can weaken the longer adaptive cycle. 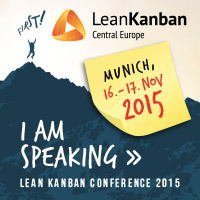 The system risks to go into a state of cascading failure. I am sure I have only scratched the surface here. I decided to put this post out anyhow to get early feedback. So, all input and feedback welcome! I will update the post to improve it. This entry was posted in adaptive cycle, complexity, cynefin, panarchy. Bookmark the permalink. Where to place collapse and imposition? 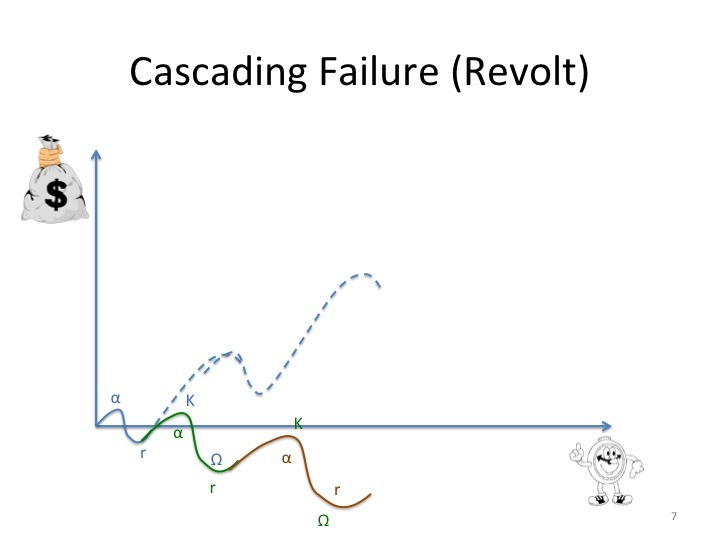 So is cascading failure a system collapse (in cynefin from simple (standard practice) to chaos(novel practice)) where events in smaller cycles (independent) hits the bigger cycles and a period of chaos is entered until a new normal is established in K and released in omega? I suppose imposition is also a revolt. We all know stories about where a system is forced into a certain state (e.g. pesticide offering a (very) short term solution to a plague but in the mid term polluting the environment). It is also a kind of revolt leading to a new normal (e.g. mono culture agriculture with reduced biodiversity as a result). In project management it is imposing a one-size-fits all management approach leading to reduced resilience and agility of the organisation. Or is the move from K to release a system collapse? A short, comprehensive overview of the Panarchy Model. Guess I’m not the only one believing this can be a guiding theoretical model for business management. Patrick, I find your post very concise and therefor I took the liberty to re-blog your post! Is it fair to say that Cynefin and Panarchy address the same in a different representations and with different emphasis? In the Panarchy model, the dynamics takes the centre stage in the representation. In Cynefin the different domains take the centre stage. I understand that Cynefin allows for multiple dynamics (e;g. collapse and imposition). 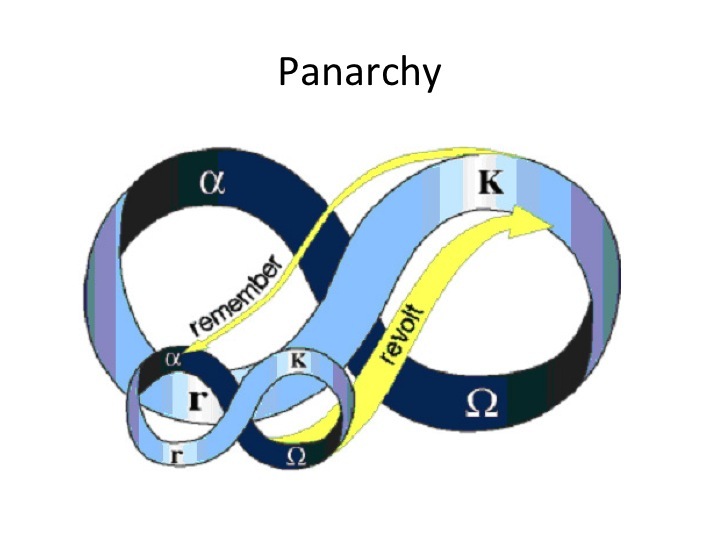 Panarchy also caters for multiple dynamics but by the way it is represented, emphasises the anarchy dynamic. I tend to use the Panarchy model exactly when I want to emphasise this dynamic. In different contexts different representations seem useful to me. They talk about a diagnostic tool for institutional change.